Pennsylvania Railroad location "XA" denotes Lewistown, south of the Juniata River, which can be discussed in two sections. The first is the "main line" between Harrisburg and Altoona, and the second is the portion on the Lewistown Secondary, which includes the yard and the American Viscose plant. Photo shows "J" tower above the passenger station circa 1954 with the "shaggy" roof. 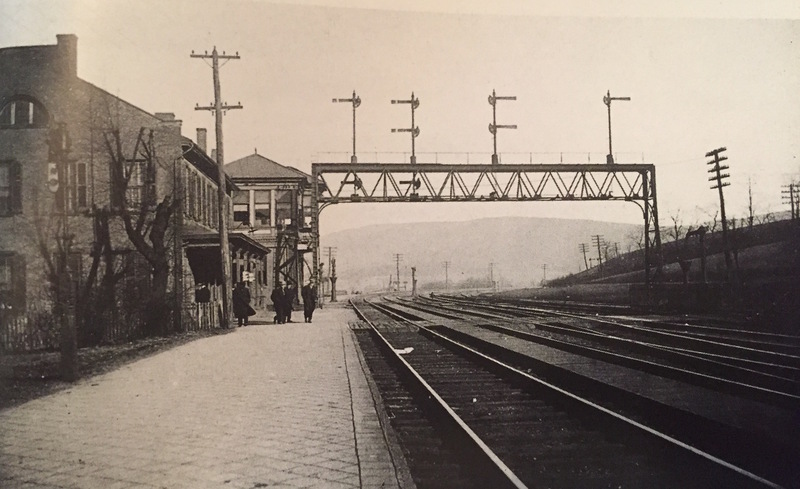 Between 1849 and the end of 1853, construction of the original Lewistown station about 200' east of the present station. It was a three story brick structure that included a hotel and restaurant. In 1868 the present station opened, having been a renovation and expansion of the 1849/50 freight warehouse. It measured approximately 40'6" by 126' with bays on the front and back which measured 8'6" by 15'. There was a brick signal tower above the bay on the main line. It may have been part of the original 1849 building, but was definitely added prior to May 1, 1876, when manual block operation went into effect between Philadelphia and Pittsburgh. Block stations and manually controlled block signals were located every few miles. The tower above the station was designated "J" block (MP 61.0) -- "WK" was located 1.7 miles to the east (59.3) and "GB" [LEWIS] was 1.1 miles to the west (62.1). Initially banner-type signals were used, but lower-quadrant semaphores were in use by the mid-1880s. In 1898 a small baggage building was constructed immediately northeast of the passenger station. It was of frame construction and measured 24' by 20'6". Between 1902 and 1903, a frame passenger shelter was built on the eastbound platform, measuring 9 to 12' wide by 112' long. An under-track pedestrian tunnel was constructed at this time. Also in 1902-03, "WK" block station was relocated an additional 1.2 miles eastward. A new tower was constructed with the installation of a new interlocking plant and a mechanical interlocking machine with 33 working levers and seven spare spaces. Between 1903-04, the crossover and signal layout at Lewistown Junction was revised. A new two-story brick and frame interlocking tower was constructed about 700' east of the passenger station. Although the tower physically remained above the station, the role of "J" transferred to the new tower. New signal bridges were constructed and a new mechanical interlocking machine installed with 40 working levers in a 48-space system. In 1905-06, a new Granville Bridge was constructed immediately west of "GB" as part of four-tracking the main line. A new "GB" [LEWIS] two-story frame tower was constructed with a footprint of 16' by 28'6". A 44-lever frame mechanical interlocking machine was installed. New home signal bridges were installed, as were electrically operated distant signals. Sometime between 1906 and 1911, "GB" tower was renamed "RW" [LEWIS]. In 1913-14, automatic block signals went active between Denholm ("MI") and Huntingdon ("HM"), and "WK" was removed and the tower closed. A new "J" tower was constructed about 600' west of the passenger station. It was a 14'6" by 28'6" frame structure. It went into service on July 23, 1914. The new interlocking was electro-mechanical, with 16 working mechanical levers in an 18-lever frame, and 15 working electrical levers in a 16-lever frame. The interior of "J" tower in 1914. It is unknown which "J" tower location is depicted. During this same time, a new electro-mechanical interlocking machine was installed at "RW" [LEWIS]. It was a P3 type and had 8 working mechanical levers on a 12-lever frame, and there were 13 working electrical levers in a 24-lever frame. It went into service on January 21, 1914. In 1925, the interlocking plant at "J" was simplified and the tower was taken out of service permanently. Its interlocking was made an extension of "RW" [LEWIS] block station. On September 30, 1928, "RW" tower was renamed "LEWIS". Other than the application of electro-pnuematic operation s of October 23, 1952, the LEWIS plant remained without significant change through at least 1984. Sometime between 1962 and 1970 the bay was removed from the front of LEWIS tower and the building was sheathed with insulbrick siding. As passenger service dwindled during the 1950s, changes were made to the infrastructure at Lewistown Junction. At some point the tower atop the station was removed. Many photos noted as taken in 1954 show the tower; photos noted as taken in late 1955 do not show the tower. I've observed that the overall roof looks a bit shaggy in the earlier photos and clean in the later photos. I suspect the station was completely re-roofed and the tower removed in the process. During this time the older station was removed and the west end of the station was transformed for Less than Carload Lot or small package freight service. The tower atop the station was restored for cosmetic purposes after the property was transferred to the Pennsylvania Railroad Technical and Historical Society, which houses its archives there to this day. Just east of the station was the Railway Express Agency, occupying a building that was the original passenger station for Lewistown. Supposedly a portion of the building was originally a hotel, it is shown as apartments on the 1928 Sanborn map. Immediately east on the Sanborn is an empty lot, once occupied by "J" tower circa 1903-13. To the east of that, an apartment building which shows prominently in period photographs. 1928 Sanborn map, corrected to 1948: In the foreground is the "mail catcher" for west bound mail trains that do not stop. In the background one can see the apartment building, the REA building, then the station. This photo is post 1954 given the absence of the tower structure on top of the station. Spur between tracks two and three allowing set out of bad order cars. Listed in the 1945 CT1000. In 1886, a new enginehouse was constructed, but it was consumed by fire in 1887. It's replacement was built by 1889 and was believed to have 12 stalls. By 1917 it had been reduced to six stalls and by 1928 it was down to three stalls. It remained in service until consumed by fire in 1967. Listed in the PRR 1923 and 1945 CT1000's. American Viscose manufactured rayon fiber (primarily for rayon-belted automobile tires), polyester and Avistrap. Shown on the 1910 and 1928 Sanborn maps. Page 90 of Triumph IVoffers an excellent 1950 aerial photograph. The plant closed in 1972 following hurricane Agnes. Pennsylvania Railroad Color Pictorial 3, p. 63, shows a BS12 shifting coal cars in/out of the plant in 1965... indicating the plant was busy enough to warrant two switches a day. Penn Pilot offers a 1957 aerial view which provides a decent footprint for the plant, including substantial piles of coal reserves at the west end of the plant. This references the back side of the main line station. During the 1950s, the west end of the passenger station was reconfigured for less-than-carload (LCL) freight handling. Penn Pilot offers a 1957 aerial photo which clearly shows the LCL track to the back of the station. H. J. Stannert Sand Co. Sand quarry along the south shore of the Juniata River. Listed in the PRR 1923 CT1000. Not in the 1945 CT1000.